How Can I Go Gulf Coast Cycle and Tri? Where is Gulf Coast Cycle and Tri in Pensacola on the Map? 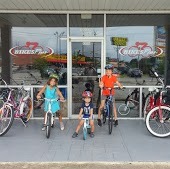 This bike shop has a knowledgeable staff with excellent customer service! I have purchased anything and everything triathlon related from them and couldn't be happier. The Owner really took his time to do a proper bike fitting and even had an extra test at the end to ensure everything was correct! When looking around for a bike shop that had a great selection of products & accessories, expertise, customer service, quality workmanship, and care... this is the only one that checked all the boxes. Buying local feels great not only because it supports our local economy, but also because I always feel like I'm getting a great deal from a friendly staff! I highly recommend Gulf Coast Cycle and Tri and plan on giving them my business for many more years to come! Great service, people and prices...The owner takes great pride in his work and business. .Spent a good amount of time shopping around and feel that buying local with GCC&T was the best move I made. Cant rave enough about the stellar experience! Made buying a Tri bike a breeze. Great staff and very helpful. Locally owned bike store that steps up to the plate in customer service. Owner is very knowledgeable about bikes and gear. Keep up the good work! Easy breezy....very nice selection on bikes. Knowledgeable and hooked a girl up on a parts for a 5 yr old bike..definitely will go back again. I am 6'2" and very heavy but made a poor choice in a beginner bike. Patrick took my poor choice and consigned it for me. Even gave me encouragin advice. This is the shop to do business with don't make the big box chain purchase mistake like I did.